Samsung start releasing updates Value Pack. This update provides several features to the ICS Android operating system is installed at Gingerbread Galaxy S, including Face Unlock features. 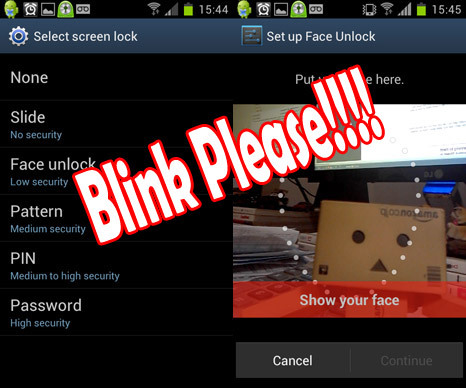 Samsung's software team has added a feature in the Face Unlock the "blinking" where you have to blink when "install" your face in front of the camera when opened Face Unlock. With a blink, it means someone is no longer possible to open your phone using facial images as photographs can not blink. This feature may be bypassed if the used video but it would be difficult to replicate. Humans themselves will naturally frequent blinking, something well accommodated in this feature. Update Value Pack is now launched in Korea so it still needs time to apply them in the handset Galaxy S is contained in another country. But there can be no official value pack will soon appear before the official update is present in other countries.